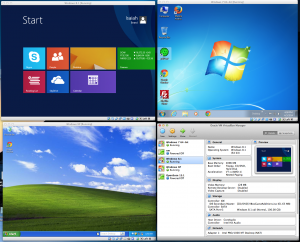 Three generations of Windows operating system versions. Upper left: Windows 8.1, the current release from Microsoft. Upper right: Windows 7, its predecessor and likely upgrade candidate for most Windows XP users. Lower left: Windows XP, whose support from Microsoft ends today. Lower right: the Virtualbox control panel, where each of these virtual instances are controlled off the host computer, a Mac. Tomorrow marks an important milestone in the lifecycle of computer software, and should be a day of concern for perhaps hundreds of millions of computer users worldwide. April 8, 2014 is the final day that Microsoft will provide extended support for its aging Windows XP operating system. Although Microsoft has not been providing any new features or functionality to this operating system since 2009, tomorrow’s deadline means that the company will also cease to provide important security updates to Windows XP going forward. This potentially means that users still running the OS could be vulnerable to security risks such as viruses and malware. Although a great deal of new software titles already require a version of Windows that’s a bit more recent, it is expected that support will further decrease dramatically after tomorrow. Arguably, this event will have a greater ripple effect in the end-of-life of any other operating system version. This is because Windows XP has endured in mainstream usage far longer than any other version of the Windows operating system, lasting nearly 13 years and still commanding a marketshare among desktop and laptop computer users of nearly 30% worldwide, even today. This impressive longevity is despite newer, more advanced versions of Windows being available since 2007, though a lot of this is owing to the fact that it’s immediate successor, Windows Vista, was met with criticism for most users who adopted it. The immediate concern for these mainstream users is whether and how they should upgrade to newer versions such as Windows 7, or the currently released version for Microsoft, Windows 8.1. For many, this also means replacing old hardware which will not adequately run more up-to-date versions. Though, this can also be seen as an opportunity by the same users to consider other alternatives, such as using a Linux-based operating system on their existing hardware, or looking at other vendors such as Apple and their Mac line of desktop and laptop systems. But the consequences of this end-of-life event for Windows XP will have a greater ripple effect long after most of these users have moved on to different hardware and software. For over a decade, a vast majority of the world’s computer users play video games, use custom software, and created documents and media on a platform that is now no longer supported by its vendor. While the more widely-used pieces of software will be updated to run on current operating systems, there will inevitably be some programs and data left behind. And this leads to serious questions for the preservationists among us. How will we preserve and keep alive old works that carry significant historical and cultural value? One commonly used option is to preserve vintage hardware along with the software. There is a burgeoning vintage hardware and retrocomputing community that has done exactly this, preserving specimens of computing past that have carried significance in past decades. If you are old enough to have used a Commodore 64, TRS-80, Apple II or even older systems in years past and wax nostalgic now and then, it is this community that ensures those historic old computers live on today. Unfortunately, not everyone has the cash, space, and means to collect and maintain antique computing hardware. And even for those who do, legacy computers will inevitably age and fail with time, and replacement parts will get more difficult to come by as time passes, resulting in these classic machines becoming increasingly rare. Fortunately, while the hardware may not live on to eternity, it’s a little easier to keep the software functioning for quite some time, without a lot of expense. Windows XP is a very fortunate position, as obsolete operating systems go. This is because while the very newest computing hardware you can buy today will have a hard time running properly under Windows XP, they can all provide a virtualized environment for it that permits it to run very well, with no modification. This stands in stark contrast to the computing environments of the past, where significant forensic work and lots of porting and programming are required to bring them back to life via emulators (a topic I’ll discuss soon in another post). With a modern computer, Windows XP and the software running under it can be installed as a “guest” operating system in a virtual environment. In other words, a high-end Windows 8.1 computer can have one of several virtualization suites installed, such as VirtualBox, VMWare, or Parallels, and run any operating system the user likes in its own window. Virtualization is a technology that came into its own as Windows XP was the dominant operating system on computers across the globe, and through it, XP can continue to run, in its own sandbox, and with it the countless software programs of the past that should be preserved for their significance. For those who are interested in trying it, there’s good news: Virtualbox is free, and a user with an existing licensed copy of Windows XP can get started fairly easy. This tutorial explains how it’s done, step by step. The only caveat is that virtualized software environments are best done on high-end computers with a lot of memory, and multi-core processors. Each virtual machine “borrows” some RAM, disk space and CPU time from its “host” computer and operating system, so it helps to know that the computer you’re has resources to spare. With luck, it is virtualization that will help Windows XP in not only being one of the longest-deployed desktop operating system environments in recent history, but also the best-preserved.